Made it by the deadline. The U.S. 5th Circuit Court of Appeals affirmed previous rulings that the 2011 voter ID law — which stipulates the types of photo identification election officials can and cannot accept at the polls — does not comply with the Voting Rights Act. The full court’s ruling delivered the strongest blow yet to what is widely viewed as the nation’s strictest voter ID law. Under the law, most citizens (some, like people with disabilities, can be exempt) must show one of a handful of types of identification before their ballots can be counted: a state driver’s license or ID card, a concealed handgun license, a U.S. passport, a military ID card, or a U.S citizenship certificate with a photo. The case centered on whether Texas discriminated against Hispanic and African-American voters when it passed the legislation: Senate Bill 14. Paxton, Gov. 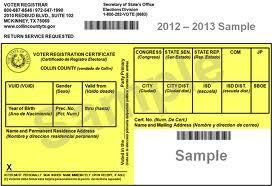 Greg Abbott and other proponents argued that the law was needed to bolster security at the ballot box by preventing voter fraud, but opponents cite the paucity of proven in-person voter fraud in the state and argue the intent was to undercut the electoral strength of the state’s growing minority population — people less likely to have photo identification or the means to obtain an election certificate. Experts have testified that more than 600,000 Texans lack such identification, though not all of them have necessarily tried to vote. Those citizens can obtain “election identification certificates” free of charge, but only if they are able to produce a copy of their birth certificate. Texas argued that opponents of the law had “failed to identify a single individual who faces a substantial obstacle to voting because of SB 14.” In Wednesday’s ruling, the majority rejected that argument. “For one thing, the district court found that multiple Plaintiffs were turned away when they attempted to vote, and some of those Plaintiffs were not offered provisional ballots to attempt to resolve the issue,” the ruling stated. Voting rights advocates were quick to praise the appeals court’s overall decision Wednesday. So the court, after considering a complicated array of factors presented by such cases, held that the law violates the Voting Rights Act. That’s the good news for voting rights. The bad news is two-fold. First, a majority of the Fifth Circuit determined that “there are infirmities in the district court’s” conclusion that Texas acted with discriminatory intent, although it also returned the case to the lower court to reconsider whether such intent existed. That matters for several reasons, the most potentially significant of which is that Section 3 of the Voting Rights Act permits states that act with racially discriminatory intent to be subjected to continuing federal supervision of their voting laws. If the courts ultimately conclude that Texas acted with discriminatory intent, they could also decide to place Texas under the same kind of supervision that the Supreme Court eliminated in its 2013 decision striking down part of the Voting Rights Act. So this is a victory for voting rights, but not a total one. Nevertheless, given the Fifth Circuit’s conservatism, it is a surprising decision. And no doubt a welcome one for voting rights supporters. Here’s more on that Wisconsin decision. The district court may try to craft a solution, but as Andrea Greer notes, it’s not out of the question that Greg Abbott could call a special session to try to “fix” the law. Mostly, it’s a matter of timing. The law as it exists cannot be used – there must be a remedy for the people who don’t have ID. That needs to be in place probably in the next six to eight weeks, to ensure there’s enough time for local election admins to communicate to voters what they will need to be able to vote. Striking the whole thing down would have been better and less confusing, but this is what we’ve got. There’s also still a chance that the district court could find discriminatory intent again under the new standard the Fifth Circuit set, and I presume that one way or another, this will eventually go to SCOTUS. But for now, a decent if not resounding win. The Chron story is here, and Courthouse News, the Brennan Center, the Press, the Rivard Report, and PDiddie have more. I guess the Mexican “consular matricula” card will be acceptable ID to vote in America now.